At the stroke of three o’ clock the Godiva Sisters and Pru Porretta dressed as Lady Goodyver (now written Godiva) proudly processed from Broadgate. Pru was clothed with the beautiful handmade cloak of 950 flowers, created by children and communities for Godiva leading up to our special day. 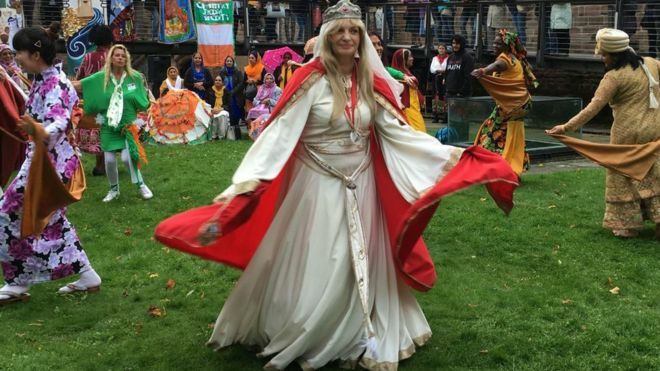 All 20 Godiva Sisters were there representing their different faiths and communities in their traditional gowns, African drumming, giant specially made banners, decorated umbrellas and several hundred people. The Godiva Trust were pleased to have our Deputy Lord Mayor – Councillor John Blundell, and Ursula Russell MBE Deputy Lieutenant of the West Midlands plus several city councillors in attendance this year. They were also pleased to have the continuing support of the Master of the Freeman’s Guild – Tony Archer, the President of Mercia Lions -Ravinder Singh Sandhu and the support of Coventry Rotary Club – John Hartley. Thanks also to the Canon for Reconciliation at Coventry Cathedral – Reverend Dr Sarah Hills, who gave such a lovely blessing on us all. There was a big crowd of Coventry people and a good celebratory atmosphere. Again the Trust thanks local schools,especially St Elizabeth’s,St Osburg’s, St Mary and St Bendedicts and the many communities for taking part – their interest and energy makes it all worthwhile. The Trust hopes that the people of Coventry will want to be involved with us again next year. Please put the date in your diary: Heritage Open Days Friday 13th September 2018. Unique chance to celebrate the actual 950th Anniversary of Lady Godiva, Countess of Mercia. Come and join our celebration in the historic Cathedral Quarter in the Heart of Coventry. Sunday 10th September is the actual feast day of Godiva Dame Goodyver’s Daye; a traditional feast day given by the Guild of Cappers and Feltmakers many centuries ago and revived by Coventry’s official Lady Godiva Pru Porretta MBE who believes that Lady Godiva is as important a figure today as she has ever been. See and admire the beautiful new cloak of 950 flowers handmade by children and communities running up to our celebration also medieval and traditional national costumes worn by our Godiva Sisters. Join in and hear music, song and dance performances with Adults and children from all around the world.Meet Godiva and her sisters: heroes in their own cultural, ethnic or religious traditions, characters both ancient and modern, whose lives have inspired and can still inspire today through the story of Godiva. Enjoy tastes of traditional Coventry God cakes, Irish soda bread, Asian, African, Malaysian and Serbian treats. The Godiva Trust helps a new generation of women from Coventry’s diverse cultures better relate and reinterpret our heritage celebration with a unique identity, and underpins the City’s International role as a Centre for Peace and Reconciliation. 1st May 2017 exhibition of 1000 year Coventry Heritage Tapestry commissioned by Godiva Trust brain Child of Pru Porretta, created and produced by multi generational and mutli cultural communities of Coventry. 11 am start.11.15 am Nailcote Hall.Just after midday continue walk via Spencer Lane to Berkswell. The Bear Inn request prior booking for lunch. The Reading Room is also open for lunches.